Galveston Fishing Guides Captain Alan and Captain Steven provide private guided fishing trips, charters and adventures on the entire Galveston Bay Complex. Most of their trips target speckled trout and red fish fishing live reefs or shorelines using live bait. They offer trips starting off at $375.00 for 2 anglers. They specialize in fishing in all the Galveston Bay waters offering a variety of trip options from 4 1/2 hour, 5-6 hour and 8 hour outings for all anglers including experienced and novice anglers. Both of these Captains focus on high quality service and customer satisfaction. Their knowledge of all the Galveston Bays, along with their expertise of fish migrations and saltwater tactics will give you an excellent opportunity to have a enjoyable and successful outing. Call Capt. Alan (832) 606-0844 or Capt. 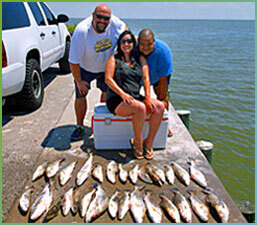 Steven (832) 659-1554 today to reserve or book your memorable and exciting fishing adventure. Topp Dogg Fishing Guides offers a variety of Galveston Bay Fishing Trips, charters and adventures including speckled trout and red fish trips. This outing along with the family/kid trips are the most popular. 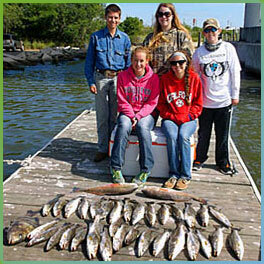 You can choose from a 4 hour, 6 hour & 8 hour Galveston fishing trip. Multi-Party boat trips or corporate tournaments are available with advanced notice. No party is too big or too small for them. Experienced & novice anglers, individuals, corporate business, friends, kids and families are always welcomed aboard. Capt. Alan and Capt. Steven really look forward to spending a great day on the water fishing with you and all your guest, giving everyone an unforgettable fishing memory. If both Captains are booked for the day you desire or want to reserve, they can always get you out with a quality Galveston Bay Fishing Guide that is also highly skilled fishing all the Galveston Bay waters. It is time for you to join in on all the excitement that Galveston Texas fishing has to offer. Both Captains are very professional and courteous full-time Galveston Fishing Guides. Every year they each provide seminars and teachings on saltwater fishing at various events including the Houston Fishing & Boating Show. They also fish multiple corporate tournaments and also some individual tournaments. They both truly believe in giving back to the local community, educating our youth, supporting our local fisheries, the outdoors and recreation. Capt. Alan and Capt. Steven are members of multiple Pro Staffs and Guide Programs. Topp Dogg Guide Service has over 25 quality sponsors, many repeat customers and loyal supporters. They are also fully licensed by the United States Coast Guard and the Texas Parks and Wildlife Department. Spring is here and we are starting to get booked up. April and May will bring warmer water temps & trout should start showing up more abundantly. Fishing can be action packed with lots of trout & red fish being caught this time of the year. so give us a call so you can get a day reserved. It is pretty simple this time of the year, when the weather is good, the fishing is good. Get in on all the fun and please give me a call soon if you are interested in booking a bay outing. I am looking forward to a great year of fishing in 2019. Hopefully we can get some better weather this year during spring and continue to have productive outings. If you want to read a more detailed Galveston bay fishing report with pictures, locations and baits used, please check out my Galveston fishing reports page. You can also go to our Facebook page to get reports from a variety of Galveston fishing guides. I try to update both on a regular basis. Until next time, see you on the water. "Thanks, Capt. 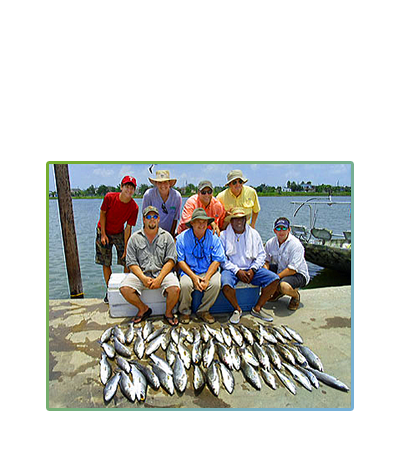 Alan"
Galveston Texas Fishing is well-known for excellent action all year round. The Galveston Bay Complex is the largest estuary on the Texas Gulf Coast and is considered by many anglers as the best. Every year, Galveston Island will attract many visitors and anglers that want to experience catching quality speckled trout, some beautiful red fish, flounders or other diverse saltwater species that inhabit the Galveston waters. Capt. Alan and Steven fish the entire Galveston Bay Complex including East Bay, West Bay, Trinity Bay, the North and South Jetties, the Galveston Ship Channel and the rest of the surrounding Galveston Bay waters. Live shrimp under a cork or live croaker on bottom is usually used on most trips, but both Captains can also fish with a variety of artificial baits. Family, kid and discounted trips are available at different times throughout the year. On these outings you will fish shell reefs that are a little closer to the shore or the North or South jetty. These outings target a wide variety of saltwater species like sand trout, croaker, whiting, sheep head, black drum and big bull reds. You will need to check with Alan or Steven for availability. Spring Break trips during March & April and Fall trips during October thru December are a lot of fun for anglers that enjoy non-stop action. On all outings you will be provided with the best quality spin casting reels loaded with braided line, top of the line graphite rods, all new tackle and the latest up to date artificial baits. At the end of the day your Captain will fillet and package your fish. When you are looking to book a Galveston fishing guide, you should always consider the guide's or Captain's experience & knowledge of the waters that you will be taking your trip in. A guide with the right experience, will give you a great chance of having a successful outing. Both of these guides have been fishing the Galveston Bays for over 25 years and guiding professionally for over 18 years. They have spent countless hours fishing and learning the entire Galveston Bay System. While on your outing, they will also teach you saltwater techniques, bait presentations and ways to catch more fish. You get a chance to experience great fishing and also receive teachings & learn proper saltwater techniques that will help you become an all around better fisherman. Both Captains are known and often thanked for their patience with kids and new fisherman. It doesn't matter if you are a novice or an experienced angler, Topp Dogg Guide Service has the right fishing trip for you. 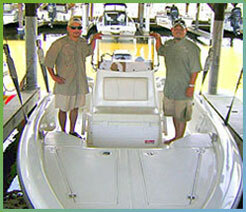 You will receive your Galveston Bay fishing trip in a 24-foot Kenner center console boat. This boat is a very fisherman friendly boat with plenty of room that allows 1-4 anglers to fish with ease from. It is powered by a Susuki DF250 four stroke motor with top of the line electronic equipment on board including a Garmin GPS and a Motor Guide trolling motor. All U.S. Coast Guard approved safety equipment is on board including life vest. This V-bottom boat gives you and your guest a safe, smooth, dry and very comfortable ride. It is perfect for fishing all the bays in Galveston. There is plenty of storage room for all your valuables and extras. The Captains suggest that you wear proper clothing for the weather conditions, bring drinks & snacks, Texas fishing license (18 years old), favorite hat, sunglasses, sunscreen and an ice chest to take home your catch. "Last Fall I took a fishing trip with Captain Alan and two of my good friends. We are avid fishermen and love to fish most chances we get. Captain Alan was so great out on the water and brought us right into the action. First cast lead to the first fish of the day. We did not stop there, as we slowly started filling up the cooler with some good sized keeper speckled trout. My friends and I all hooked in to some slot red fish as well. At the end of the day we had our limit of specks (30) and 3 red fish. Whether you have never fished in your life or if you fish often, I would definitely recommend taking an exciting trip with Captain Alan. Thank you so much Captain Alan, l will be back very soon." "We had a great trip with Capt. Steven. Despite having higher than desired winds, we all still managed to catch plenty of quality fish. Capt. Steven was extremely professional, provided great customer service and he was very persistent in making sure that my party caught fish and most importantly that we all had fun. I feel very confident in recommending his service to anyone that is looking for fishing guide for Galveston. It is a top-notch service, they have a very roomy boat & use quality fishing equipment. My fishing trip was an all around great experience and I look forward to my next trip. I will definitely recommend Steven to all my friends and family. I know he will treat them right." "I have booked an outing with Capt. Alan and Steven 6 times over the past 2 years. Both of them have been so professional and courteous on all the trips. They have really spoiled me, my kids & my clients. Even on the 2 days that the wind was blowing, we still ended up with a nice box of fish. We caught 30-50 fish on 5 of the 6 trips. They really run a professional fishing service and they have always made me feel comfortable. I booked them because of their great reviews on the Internet and I'm so glad I did. These guys will get all my business in the future. Thanks again Capt. Alan and Capt. Steven for treating me to some great fishing over the past couple of years. See you real soon." Everything you need to know about Galveston Island can be found at Go-Galveston.com. Just click on the logo above to find information on current & upcoming events, hotels, sights & attractions, dining, restaurants, shopping and entertainment.